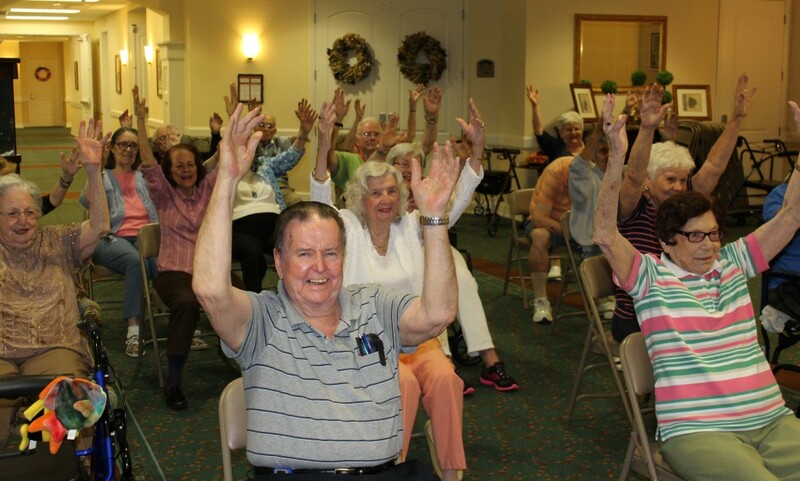 “Chair Yoga” is a popular activity with residents at The Bridges Assisted Living Community and it offers many benefits. As we age, our muscle strength begins to decline and we become less flexible. According to Nathan LeBrasseur, a researcher who directs the Muscle Performance and Physical Function Laboratory and the Healthy Aging and Independent Living Initiative at Mayo Clinic in Rochester, MN, “Most people will lose approximately 30% of muscle mass over their lifetime, and as much as 50% by the time they reach their 80s or 90s.” Participating regularly in a chair yoga class can greatly enhance one’s flexibility and range of motion through physical poses that stretch and strengthen muscles and lubricate joints. A study, published in the May 2012 issue of the “Journal of Gerontological Nursing,” found that seniors with osteoarthritis experienced improved physical functioning and reduced stiffness after completing an eight-week chair yoga program. In addition to the physical benefits yoga provides, there are other benefits including stress management and social interaction. Yoga of any kind includes breathing exercises, which has been shown to reduce stress and improve one’s mental clarity. Feeling calmer and less stressed gives way to more happiness and contentment. For those participating in a group setting, socialization and interaction with others leads to an overall sense of well-being.